Bulgaria's euro-affairs minister embarks on a trip to several European countries next week in a bid to drum up support for quick ratification of Bulgaria's accession treaty. My aim will be to secure backing for the quick ratification of Bulgaria's accession treaty with the European Union, Minister Meglena Kuneva said. She is scheduled to confer first with Italy's Minister of European Union Policy Rocco Buttiglione. 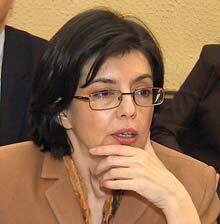 A meeting with Kuneva's Romanian counterpart will take place in the Danube town of Russe on February 16. The signing of the EU accession treaty is already scheduled for April 25. To sign the treaty of accession, the Parliament must firstly adopt several amendments to the nation's main law.